This was a quote by economist Anirban Basu from a 2005 Baltimore Sun article  citing a study his firm Sage Policy Group conducted for the Maryland Builders Association, in response to a slew of impact fee legislation adopted by several Maryland Counties. The view Mr. Basu stated is an orthodoxy shared by most municipal leaders in Maryland if not the entire U.S. To them, more residential development means, more tax revenue for the county’s coffers. Fourteen years have passed since Howard County enacted legislation that allowed the collection of surcharge fees to provide infrastructure needed for new development. Who was right? The technical terms used to define the fees differ based on how the fees are assessed and spent. Howard County collects surcharge fees, while others collect impact fees. Impact fees are required to provide direct benefit in the geographical region of those who purchase the new homes, while surcharge fees have no geographical restriction. Impact fees are also supposed to be spent within a prescribed period of time, after which they are returned to the Developer. For example, the construction of High School #13 will cost nearly $78,000 per new student. Furthermore, at the rate of 0.5 kids per home in Howard County, it costs $15,000 per student to run the public school system. It costs an average of $78,000 per new student to build a new school and $15,000 per student run it. Radio personality Marc Steiner once said "Developers are the defense industry of local governments". In 2004, the Maryland State Legislature enacted a law that enabled Howard County to charge Developers surcharge fees. The fee was set at an arbitrary value of $1 per square foot, without any analysis to demonstrate the fee was market rate. The 2004 bill also tied the County's hands by preventing it from adjusting the fee in the future. Consequently, since 2004, the fee has increased only at the rate of inflation to an annual rate of 1.7%. In 2018, the average impact fee per new home was $5,280. By comparison, Montgomery County charges nearly $30,000, increasing at an annual rate of 9.8% over 14 years. Since 2004, Howard County has approved a minimum of 1,700 homes per year, or nearly 24,000 new homes in 14 years. 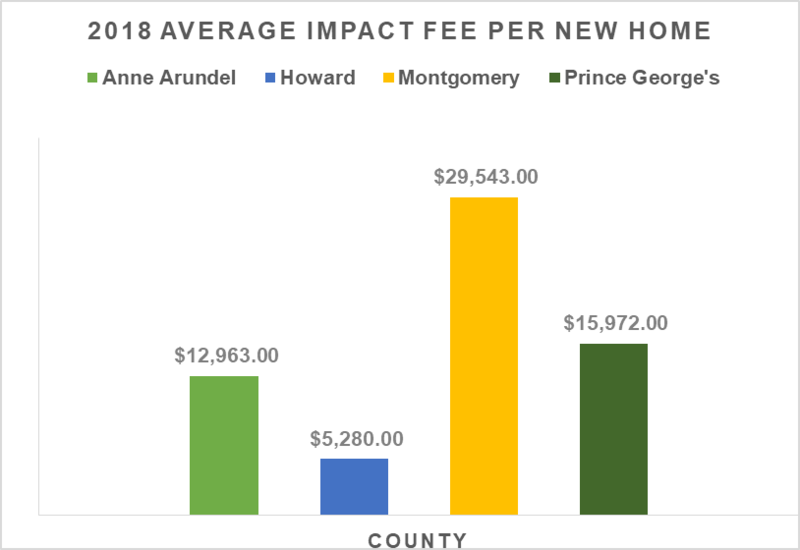 If Howard County's impact fees kept up in pace with Montgomery County, it would have received an additional $500 million in fees. The county subsidized developer profits to the tune of $500 million. For perspective, as of October 2018, the school system’s deferred maintenance has exceeded $500 million. Furthermore, the county’s trailer classrooms have increased annually to over 200 over those years. Howard County issues bonds backed by the collected surcharge fees. Since 2004, the county issued $101 million in bonds based on $84 million in surcharge fees. Assuming it can realize 20% more in funds through bond financing, how much would the county have raised based on market-rate surcharge fees? That is to say, if the county charged market-rate surcharge fees instead of subsidizing developer profits? If the county had collected the additional $500 million, it could have raised nearly $720 million in bonds for schools. Every year, the county appropriates funds for various capital projects. Between 2011 and 2017, an average of 5% of the county’s capital budget was appropriated for road construction and resurfacing. As of 2017 an all-time total appropriation 8.7% of the county’s capital budget was set aside for these two programs. Many of the county’s roads are operating at a very low level of service. Not by accident, but by design. For example the level of service for the intersection of Snowden River Parkway and Broken Land Parkway is ‘F’ because the mitigation process through the adequate public facilities ordinance (APFO) requires a low level of service standard. Furthermore, the county collects very little money from the main beneficiaries of the road improvements- developers of the various businesses along the road. The county approved construction of a Royal Farms gas station on Snowden River Parkway and Minstrel Way. Over the years, the approval of many such businesses led to significant congestion on the Parkway. But, the price-tag diverges significantly from the amount estimated by the Developer-financed study of $123,815.50. “With a total cost of $123,815.50, the pro-rata share [Royal Farm's cost] for this development at 10.8% would be $13,372 (10.8% of $123,815.50)”. So not only is the basis for the traffic study a weak APFO mitigation standard requiring low quality of service, the estimated cost impact is 83.5% less than the actual price tag. Furthermore, the Developer will pay only 1.78% of the actual price-tag. Not 10.8%. Here again is an illustration of how poorly the county does a poor job of accounting for all externalities in assessing the impacts of a project. In this case the job is to mitigate road congestion. Since 2011, the average annual contribution to the capital budget by Developers is equivalent in percentage to the road example presented earlier. More than 61% of the capital budget is financed through bonds, while developers pay less than 1.8% of the cost as shown by the road construction example. The average annual developer contribution is 1.79%. Howard County has spent an average of $100 million per year since 2011 to service these bonds, which amount to nearly 41% of the capital budget, 7.5% of the operating budget, and 6% of the total budget. Little doubt exists as to the root cause of the deficits. Exorbitant bonds to finance capital projects primarily cause by unmitigated development. County leaders have not used the benefit of hind-sight to change course. In fact they continue to push for policies based on the orthodoxies and economic approaches championed by Mr. Basu and many others in 2004. Why is their approach wrong? Let’s get back to impact fees (or surcharge fees in Howard County). 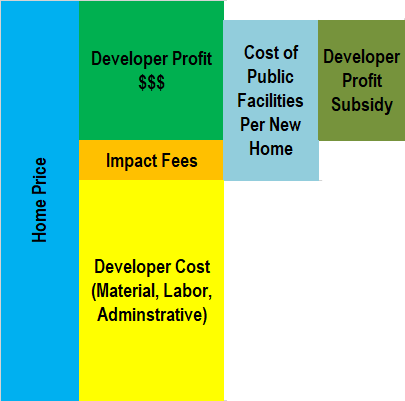 The approach is based on the traditional view  on impact fees that looks at the supply-side effect on housing. Broadly speaking, their orthodoxy says “more housing means more revenue”. According to the traditional view, impact fees are like excise taxes, which shift the short-run supply of housing up by the amount of the fee in a competitive market. The traditional view predicts, higher house prices, lower developer profits, and reduction in new home construction. In addition, the traditional view predicts impact fee increases would reduce prices paid to land owners and would hurt the availability of affordable housing. Developers would then be forced to leave the jurisdiction to avoid paying the fee. Consequently, the Developer flight combined with a reduction in tax base would lead to a decline in overall economic activity. The Development Industry published a playbook  to reinforce the orthodoxy and traditional view of development. A snapshot of this playbook is shown. In addition to the predicted economic calamity, they also suggest the use of transfer taxes as an alternative means to raise infrastructure fees. The traditional view has a fatal flaw, but it has the advantage of being intuitive to any consumer who has purchased any kind of goods. The concept of an excise tax getting passed on to the consumer is easy to understand since it happens every day. Alcohol and cigarette tax, gas tax, electricity tax, etc…This fatal flaw is reflected in the figure provided by the developers impact fee playbook. This is not to say the model is not applicable to other jurisdictions, albeit with some heavy caveats. In Howard County, the traditional model has led to an increase in county debt, decrease in quality of infrastructure, and massive developer profits. In Howard County, the traditional model of development impact has led to an increase in county debt, decrease in quality of infrastructure, and massive developer profits. What happens in jurisdictions with low or no impact fees? Developer profits are subsidized because the taxpayer funds all infrastructure. Furthermore, growth is delayed through lengthy planning review processes and a moratorium may be put in effect [by the taxpayer who becomes sick of subsidizing those profits] . Finally, developers move to other jurisdiction because of the inadequate public facilities and low quality of life they activities created. In the long term, home prices decline because consumers look for jurisdictions with better infrastructure and the remaining tax-base is saddled with all the costs of maintaining existing infrastructure. Since the remaining tax base is poorer it won’t be able to sustain the burdens, which leads to higher debt, resulting in a municipal financial crisis. That is to say, it is the low quality of infrastructure that leads to decrease in demand, not increase in impact fees to keep up with infrastructure needs. There is an approach to development that more accurately reflects its impacts. This "new" view, discussed in great detail in  says, impact fees are nothing more than the cost of providing valuable facilities to new development. They offset property taxes that would otherwise have been assessed, leading to a savings in these costs that will be capitalized into home values. They improve the timeliness of availability of infrastructure, which increases the supply of developable land by adding capacity to public infrastructure. Empirical studies on effects of impact fees indicate future property tax increases are averted when the cost of public infrastructure is paid by the Developer at the time new homes are built. Studies also show that impact fees have at best a boosting effect on job and economic growth and at worst a non-discernible effect. Furthermore, impact fees have an insignificant effect on construction rates, while positive effect on demand for homes in inner and outer suburban and rural areas. The study demonstrates that very little relationship exists between the Developer claims that impact fees reduce affordable housing. The mechanism to provide affordable housing in a jurisdiction with high home prices is not through low impact fees. The framework used to assess the effects of new development needs to change. Not only is it grossly inaccurate and misleading, it does not take into account a key metric in the analysis. For example an economic and fiscal impact study of the update to the county’s adequate public facilities ordinance (APFO) prepared for the Howard County Economic Development Authority  predicted a decline in “residential construction and employment activity” and a broader decline on “residential income and spending impact”. The predictions like those made by Mr. Basu in 2004 are not accurate because they have no consideration for the impact on the level of service. For developers, the level of service is an afterthought. A socially, economically, and fiscally optimal rate of growth can only be achieved only when the impacts of growth on each of these factors are internalized. Level of service of public infrastructure must be the main driver of new development. In a spectrum with extremes of moratorium at one end and unregulated development on the other, impact fees actually represent a happy medium. Been, V. (2005). Impact Fees and Housing Affordability. Cityscape,8, 139-185. Retrieved from https://www.huduser.gov/periodicals/cityscpe/vol8num1/ch4.pdf.